. If you have a personal motorcycle, article or your chapter has articles for sale, you are welcome to use this space for advertising purposes. Simply send an email to the webmaster@bkglrc.com and include information you wish to be displayed. 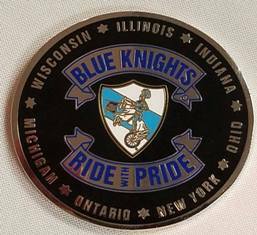 Please remember to remove Blue Knight decals if selling to a non Blue Knight person. Note: Personal items will automatically be removed after 6 months, unless otherwise notified. 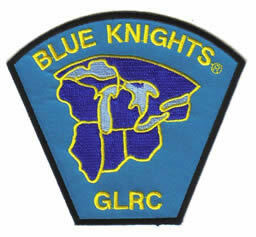 GLRC Conference Patch for sale at a reasonable price - just $3.00 US which includes shipping to you! 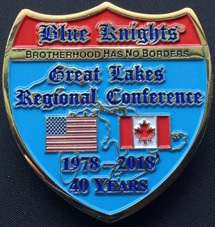 Show your support for the conference and purchase one today. Better yet, purchase enough for your entire chapter to help with the shipping costs. 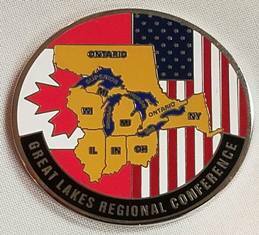 Contact our GLRC Treasurer or attend a conference weekend! For sale $800.00 or best offer, new tires with spare, new wiring, ball bearings new. Call Howard, Ontario I at 519-471-2002​. Time Out Motorcycle Camper Trailer with cooler rack and cooler. Fits Queen size mattress, plenty of room to stand up and change. Cargo storage. Zip up windows and door with screens. Water proof. Pulls easy behind Gold Wings and Harleys. Sets up in less than 5 minutes. Retails new for around $4,300.00 or more. Not in a hurry to sell it as we enjoy it so much but I’m thinking about something different and will sell it for a fair price of $2,500.00 firm. It is in great shape and ready to roll out for your next camping trip. Contact Rich Dolbow at the below contact info if you would like more information. This trailer can be pulled with a vehicle too.